Join us from 3:00PM until 11:00PM today for your chance to share $4,000 in cash giveaways. Join us tonight for our $20 Rebuy tournament. Unlimited $10 rebuys until the first break. Players may rebuy at 1,000 in chips or less. Players will receive 1,000 in chips for each rebuy and 1,500 in chips for the $10 add-on offered during the first break. Win a seat into the next Ante Up Poker Tour Event at the Running Aces Harness Park tonight at 7:00PM. Buy-in is $100 and registration opens at 5:00PM. Players don't forget to join us for our Friday @ 5 Deep Stack Tournament. Buy-in is $125 with 10,000 chips to start. Registration is now open! Paul H from Sacramento is the winner of today's $125 Buy-in Holiday Event. Our $125 Buy-in Holiday Tournament drew 207 entrants this morning. The prize pool was $20,700 with first place worth $5,793. Our next holiday tournament will be Monday February 18th at 11:00AM. Win a seat into the next Ante Up Poker Tour Event at the Red Rock Casino Resort Spa tonight at 7:00PM. Buy-in is $100 and registration opens at 5:00PM. The field for today's Friday @ 5 Deep Stack tournament has been set. 127 players participated with a prize pool of $12,700. First place is worth over $4,000. Our next Friday @ 5 will be next Friday January 25 at 5:00PM. With just under an hour of re-entry period remaining, the head count sits at 111. The current prize pool is just over $11,000. 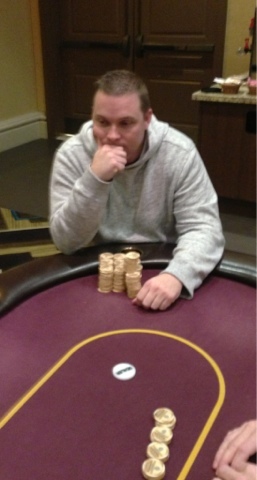 Players don't forget our Friday @ 5 Deep Stack this afternoon. $125 Buy-in with 10,000 in chips to start. Registration opens at 3:00PM. Omaha 8 or better tonight at 7:00pm. Buy-in is $75, registration opens at 5:00pm. On The Clock 4 Of A Kind is offered every Tuesday and Thursday from 12:01AM-11:59PM. Guests must be participating in a jackpot eligible live action Texas Hold'em game to win. Win your share of up to $500 for any 4 of a kind. Players don't forget, new to this year's tournament lineup is the $20 Buy-in NLHE tournament tonight at 7:00PM. Unlimited $10 Rebuys until the first break and an optional $10 Add-On offered during the break. Last weeks prize pool was over $1,700. Registration opens at 5:00PM. Don't forget about the changes we have made for the 2013 tournament schedule. We now offer scheduled evening tournaments every Monday, Wednesday, Friday, and Sunday. In addition to our regularly scheduled evening tournaments, we also offer Ante Up Poker Tour Satellites on Saturday. Ron is a local poker player who has been playing poker at Thunder Valley Casino Resort since we opened in 2003. 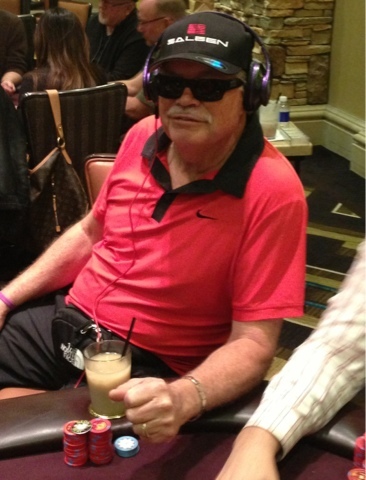 His poker nickname "Neon" was adopted before live poker was introduced here at Thunder Valley. Before live poker, Thunder Valley offered tournaments and live play through machine play. Since Ron operates a neon sign business it only made sense his poker machine loggin would be "Neon." Almost 10 years later, few of us would know him by any other name. Neon was first introduced to poker at a young age, but did not begin playing seriously until 4 years ago. He enjoys playing No-limit cash games as well as No-limit tournaments. Although he enjoys both, his tournament game is one area he plans to focus on in the future. Neon enjoys playing poker at Thunder Valley because of the staff and ambiance the resort offers him. He also enjoys the comaraderie and gamesmanship of other local players. 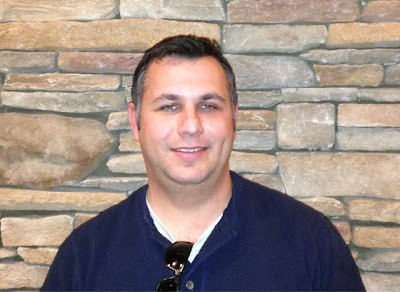 When he is not playing poker, Neon enjoys playing tennis, snow skiing, and most recently sky diving. The first Friday @ 5 Deep Stack tournament of 2013 drew 117 entrants, with a prize pool of $11,700. If you were unable to attend, don't worry our next Friday @ 5 Deep Stack will be this Friday January 18. Registration opens at 3:00PM. Don't forget players, our first Friday NLHE Deep Stack $125 Buy-in is tonight at 5:00PM. Blind levels will be 20 minutes with 10,000 in chips to start. Friday morning NLHE tournament down to final two players. Join us tonight for our first $20 Rebuy tournament. Unlimited $10 rebuys until the first break. Players may rebuy at 1,000 in chips or less. Players will receive 1,000 in chips for each rebuy and 1,500 in chips for the $10 add-on offered during the first break. Join us tonight for our Sunday Night Knockout, $100 Buy-in with $25 bounties. Tournament begins at 7:00PM with registration open at 5:00PM. 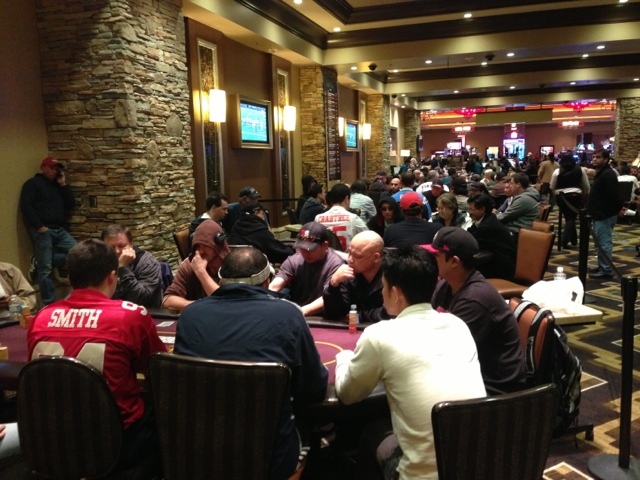 Our first Saturday $300 Buy-in had a field of 224 entrants. The total prize pool came in at $58,688! Be sure to make it for our next first Saturday $30,000 Guaranteed event on February 2nd. Don't forget that tomorrow is the first Saturday of the month! The $300 Buy-in $30,000 Guaranteed tournament begins at 11:00AM. We will hold a satellite tonight at 5:00PM, Buy-in is $60 with every 6 players generating a seat for tomorrow's event.